There are a lot of great tools out there to help DBA’s monitor SQL Server perfromance. Windows Perfmon counters and use of the Windows Relog command, for example, can be used to build a database of performance metrics. Write a few queries against that database and a DBA can learn a lot about what’s going on inside the SQL Server. Profiler and Extended Events also provide windows into performance. I recently ran across a question on SQLServerCentral.com about performance that intrigued me. The poster wanted to know if there was a way to correlate pending io requests with the queries that were experiencing the waits using the DMV sys.dm_io_pending_requests. This was a well timed question that got my attention because I was working on my own scenario with a SQL Server and IO issues. I had set up a custom data collector set in perfmon and analyzed the data. The data showed very high Avg. Disk Queue Length, low Page Life Expectancy and high Page Reades/sec for sustained periods of time. The question gave me an opportunity to do some additional investigation and I arrived at the query below. I began by looking at sys.dm_io_pending_requests in BOL. I noticed that this DMV had Scheduler_Address as one of its outputs. I quickly realized I could join to sys.dm_os_schedulers on the scheduler_address and then make an additional join to get to sys.dm_exec_requests. From there I was only a CROSS APPLY away from getting the SQL statement associated with the IO waits. Later I realized that sys.dm_os_schedulers has its own column that keeps track of pending IO called “pending_disk_io_count.” As a result, you could eliminate sys.dm_io_pending_requests from the above query if you were truly interested only in the pending io count. However, using both DMV’s does provide a more detailed picture. Also, keep in mind that, like many things in life, observed issues may only be symptoms. In my case the high IO wasn’t due to poor performing storage, but queries that were performing millions of physical reads. I examined the query plan and could see that an index was missing. I applied the index and the physical reads dropped to almost zero. However, I used the above query to bolster my case to the application vendor that the index was needed because extremely high physical IO was killing the server. Try out these DMV’s and see what else you can get from them. Suppose you’ve been working on cleaning up SQL Agent jobs and their email operators and find that you have more than one operator with the same email address. How would you tidy this up to ease administration? Let’s do a little setup to demonstrate the scenario. The T-SQL below will create three operators with different names but the same email address. Then it updates two of my existing test jobs to use those email operators when the job fails. I am also logging failures to the Windows Event Log. Now I will run this simple query to find out what my email operators and email addresses are. How does this sort of thing happen, you ask. Well, it doesn’t just happen in contrived blog posts! Suppose there is a fair amount of turnover in a DBA environment and the DBA’s are not always checking what the last person did. Each one after another goes in and does her own thing. Voila! You end up with duplicate email addresses for email operators. Some jobs have “DBA” as the email operator. Some have “Super Human Person” as the email operator. You might even have a couple of “test” operators in their with “SuperHumanPerson@Mydomain.com”. Maybe the DBA didn’t think about the fact that he might not always be the DBA and so it might be better to set up an email distribution group that was controlled by the Exchange person. That would mean that as DBA’s came and went the same email operators could be used in SQL Server. Who knows! But I have seen this. So what now? How would you go about finding jobs that have failed and why would you want to look for these? You might want to do this to ensure that you are being notified appropriately of job failures. For instance, after reviewing failed jobs, you may realize that there are job failures that no one knew about. Maybe this is occurring because the jobs are not set to send email. If that’s the case see my post here so you can fix that. But how do you find these job failures in the first place? 1. Manually look at the job activity monitor for the SQL instance. 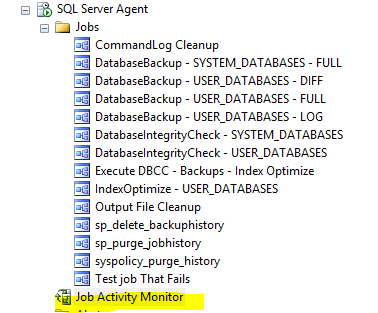 The job activity monitor is found under the SQL Server Agent node in the Object Explorer of SSMS. Just double click it to open and you will see something like this. In this case I set up a job with an incomplete SELECT statement so that it would create a failure. 2. Query the msdb database. In the last post we found jobs that had no email notification. Once you find them, how do you fix this problem? I’m going to assume that database mail is already enabled and configured on the SQL Server instance. 1. Create an operator, assuming one does not exist. This can be done either through T-SQL or through the GUI. In the GUI, right click the Operator folder under SQL Server Agent and chooser “New Operator.” Then fill in the details of operator “Name “and “Email name.” See below for an example. Then you click OK in the bottom right of the GUI to finish the process. 2. Assign that operator to multiple jobs via T-SQL. Once there is an Operator to assign to jobs with no email notifications, the next step is to actually add the new Operator to the applicable SQL Agent jobs. This will create the T-SQL that can be copied and ran in a new SSMS window, allowing you to confirm before running the statements. Keep in mind that in this example I am only updating jobs that don’t already have an operator assigned to them. This makes the WHERE clause very important. If you leave this off, copy and run the generated statements, then all jobs will be updated to whatever was specified in the variable. This may not be what you want for your environment, so please be sure to use the WHERE clause and choose notify_level_email = 0 if you only want to update jobs that have no operator assigned to them. Notice that I am using sp_update_job not only to add the email operator, but also to set the job to log to the Windows event log in case of a failure. Why? Well, what happens if database mail is not configured properly? Maybe it worked when the job was created, or maybe it worked the last time you touched database mail, but what if someone else made changes to it? In that case, you might not get the expected email when the job fails. If you have someone, like a Junior DBA, who is looking through Windows Event logs for issues they might find it. Or what if you have one of those slick 3rd party monitoring that scans for errors and notifies you when it finds one? Then you have another way to be notified that the job failed. And here is your BOL link to all the goodies involved with sp_update_job. If you are using Log Shipping, there have probably been times that you have discovered that the Log Shipping Secondary is not up to date. Perhaps you found out by right clicking on your SQL Server instance and running the performance dashboard report for Log Shipping Status. If you are not familiar with this report check here. Perhaps there is a Reporting team that uses that secondary and they met you at your desk upon arrival, informing you that the database is not online so they can’t work yet. So what do you do when you realize that the secondary is so far behind that it is probably not going to catch up on its own? This process assumes that you have a Log Shipping config set up to run a Log Shipping Restore job just prior to the beginning of the business day and that job leaves the database in Standby mode so it can be read from. At the end of the business day the log shipping restore job has one or more schedules set to kick off restores for the transaction logs during the business day. Here is a process you can use. 1. Disable the Copy Job on the secondary that is behind. 2. View the previously mentioned Log Shipping Status report and determine which file is the next in line to be restored. 3. Create a folder in the path where the transaction log backups are being copied to and perform a Cut operation on all the files just after the current file being restored. 4. Paste those files into the folder you made in step 3. Here is what you have accomplished with this. You have set up the database to go to Read Only/Standby once the current file is done restoring. It can’t continue the restore process because it has reached the last transaction log file in the original folder path. If the Reporting team can live with the data as is, then they can get to work while you set up the next part that will allow you to catch it up. If it still is not usable for the Reporting team because the data has to be more current, then you have still helped yourself because you have to get the database out of recovery mode so you can do the next part to catch it up. 5. Take a differential backup of the current database. 6. While that is running, open SQL Server Management Studio to set up your script to restore the most recent full backup and the differential you are making. Remember to consider that you may have to use the WITH MOVE part of the RESTORE database syntax because the location of your files on the secondary may not be the same as on your primary. Also, if your Log Shipping config is designed to leave the database in Standby then you will need to use the WITH STANDBY clause and then name the .tuf file where the redo information is kept. 7. If the Reporting team started querying after step 3 you will need to ask them to disconnect because you can’t restore a database while other sessions are connected. Alternatively you could use ALTER MYDB SET SINGLE_USER WITH ROLLBACK IMMEDIATE at the beginning of your RESTORE script but that would be inconsiderate. 8. Once the secondary is done restoring the most recent transaction log it was on, start the restore scripts you built in step 6. Once this step is done, you can inform the Reporting team that the database is ready to be queried. 9. Cut and paste the files from steps 3 and 4 so they are back in the target folder for the copy job. 10. Re-enable the Copy job. Once step 8 is done, you can inform the Reporting team that the database is ready to be queried. Ever had a situation where a small in-house application written for a small group of employees needed some permissions in the database? How do you handle that? 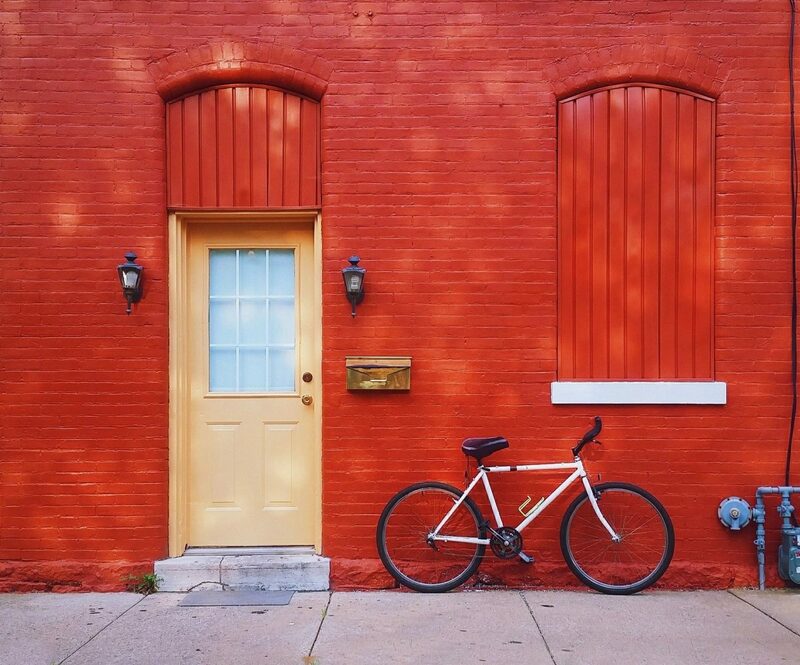 I want to walk through the scenario and provide three reasons that using a Database Role might be the answer you are looking for. Let’s first cover, at a high level, the different levels of permissions in SQL Server and the associated commands. In SQL Server there are Server level permissions for the SQL instance and there are database level permissions. Within the database level there are also specific permissions for objects like tables, views and store procedures. There are also database permissions that can be grouped together in a database role. 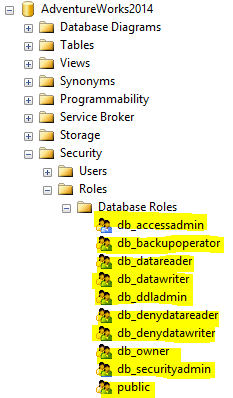 In fact, there are some built-in database roles for SQL Server as shown below. If you aren’t familiar with these, you can find out about them here. As an example, suppose there is an application being written for a small department in your company. The application needs access to your company database, but not access to everything in the database. Perhaps the app only touches a few tables. Someone could grant the Server level permission of SysAdmin to a Windows account or Windows group that contains the necessary people added to it in Active Directory. That would be a “sledge hammer” approach to providing permissions and break the principle of least privilege. In this scenario, a database role could be used to accomplish the task at hand. On your domain you or the System Administrator can create a group called MyDomain\DepartmentName. With the pseudo-code below as a model, you can create the Login and User. In this new AD group, you place the members of the department. This allows the department members the ability to use their already familiar Windows passwords, keeping it easier for them. Using Windows groups also makes it easier for you. If you aren’t convinced of that read this post. At this point is when some people might still take the approach of giving big permissions by mapping the created database user to the db_owner role in the database and be done with the process of permissions. However, do you really want a group of people in a department to have complete control over the entire database. Somehow I doubt it, and I doubt your auditors want to see that either. Permissions could be granted to the user account itself inside SQL Server, but what if other people who are not yet in the appropriate AD group want access? Now you either have to add them to that AD group, which might now make sense from an organizational perspective, or you have to start this process all over again with a new login and user. This is where Database Roles come in. Below is example code on how you would do that based on the process we already have in place. So what are some reasons to use a process like this? First, the application will follow the principle of least privileges. This means that the application and the users of the application will only have the permissions required for the functionality of the application. This keeps your SQL Server more secure, which makes auditors happy. Second, this type of process eases administration. When the application is expanded and more people begin to use it and for different purposes, just create a group like the first one demonstrated and add the group to the role. Grant any additional permissions needed to the role. No adding individual logins to the SQL Server and no applying permissions to many individual logins, which would be a pain. Now you have a single point of permissions administration within SQL Server – the Database Role. Additionally, if there are new employees in the department who need access to the application, simply add those people to the AD group and you’re done! Third, you and the System Administrator get some face time!! Who doesn’t like a little collaboration?